'Skirza' is situated in the heart of Brodick on the Isle of Arran and is the perfect self-catering holiday accommodation from which to enjoy your stay. We can accommodate up to 6 people with availability from April to October and Christmas and New Year. 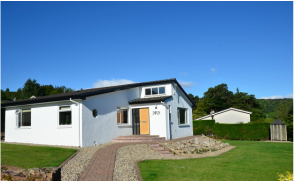 'Skirza' is a 3 bedroom detached house situated in Brodick and sleeps up to 6 people. Sorry, no pets. Please click below for details. We are located in the centre of Brodick, a short drive from the ferry terminal, with views over the hills and Brodick Bay. The house is available from April to October and Christmas and New Year with WiFi, bed linen and towels included in the price. Please click below for details.